I swear I'm not getting paid by Defected but here we go again with another stunning release on their label. 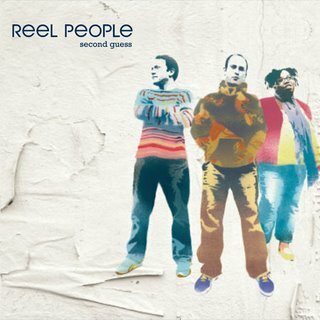 Or rather, a re-release, as Reel People's "Second Guess" was first released by Papa Records in the UK back in 2003. Now, it has resurfaced as a package that includes remastered tracks from the original release, three new tracks and a bonus CD of mixes and 'live' interpretations (which still sound like studio tracks, if a bit looser than in their original guise). You can get it here at Amazon.com. A mix of soulful R&B, jazzful funk and some soaring beats and vocals, the whole affair seems to flow as if the band had been putting out albums for years. But looking a bit further into the liner-notes you realize that the depth comes from the amazing array of producers and singers involved reading like a who's who in soulful house music: On vocals, Angela Johnson (Cooly's Hot Box), Dyana Fearon (D-Influence) and Sharlene Hector (Basement Jaxx); on producing duties, Restless Soul's Phil Asher, Nathan Haines, DJ Spinna and the amazing Bugz in the Attick, among others. You can hear samples of the tracks at the Reel People link above but stand-out tracks include the uplifting "In the Sun," the sublime "Can't Stop," the Steve Wonderish title track, the 80's mantronikly blippy remake of Thelma Houston's "You Used to Hold Me So Tight" and the cool-down funk of "Steppin." Now, those would be a stellar selection of tracks on their own but then there's also "The Rain" and "The Light" which just send the selection soaring outta this world. Hm, maybe I'm getting a bit repetitive with the high accolades? Then again there's been some outstanding music released recently (you just gotta look for it).